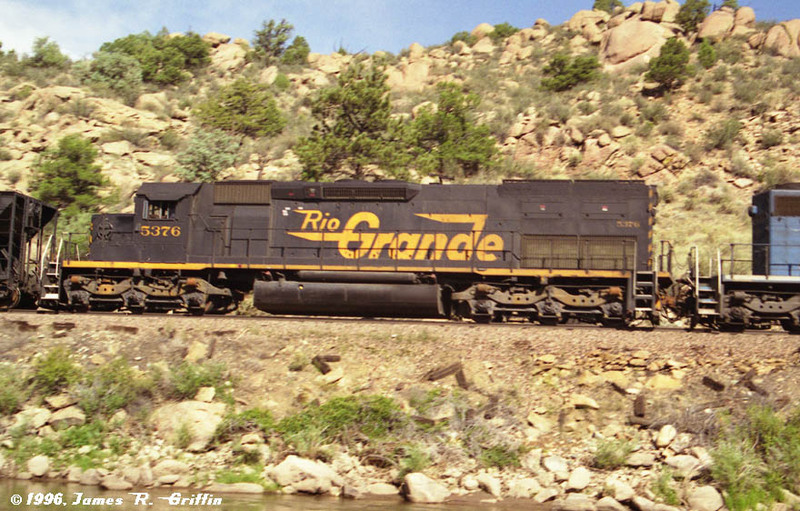 Rio Grande owned a total of 73 SD40T-2 locomotives, nick-named “tunnel motors” for their unique radiator arrangement which drew intake air from deck-level grilles at the rear of the unit. This was designed to more efficiently cool the engines when inside tunnels by drawing air from lower down. Arguments occur over how effective the technique was, but what is not argued is the fact that these units were highly successful in a demanding role. 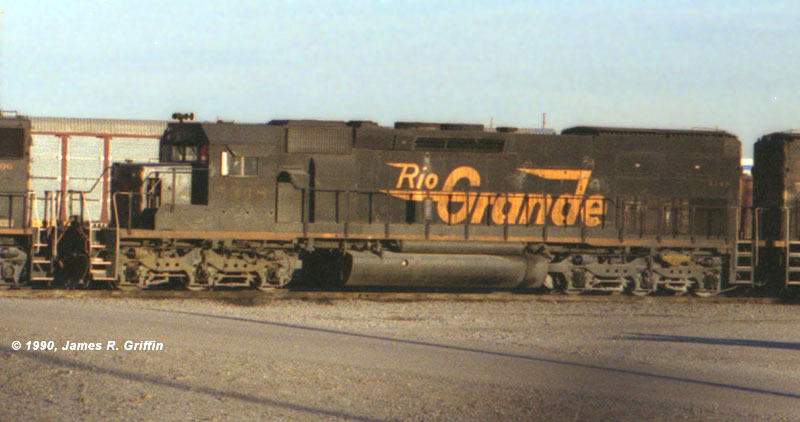 Rio Grande’s SD40T-2s came in several groups, as shown in this table. 5386 – 5397 Aug 1978 “Long” nose. Low-nose light mounted in external box. 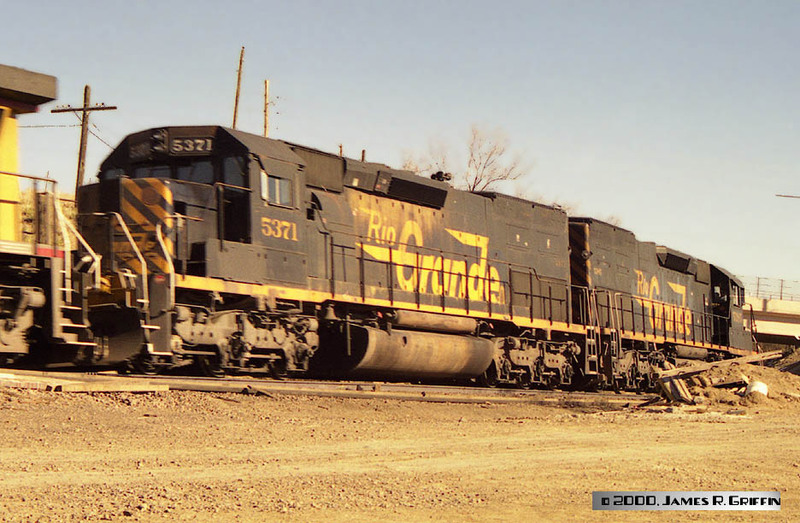 5398 – 5413 Mar 1980 “Long” nose. Leslie horns. The photos below are arranged numerically wherever possible. Final disposition data included in most cases. No. 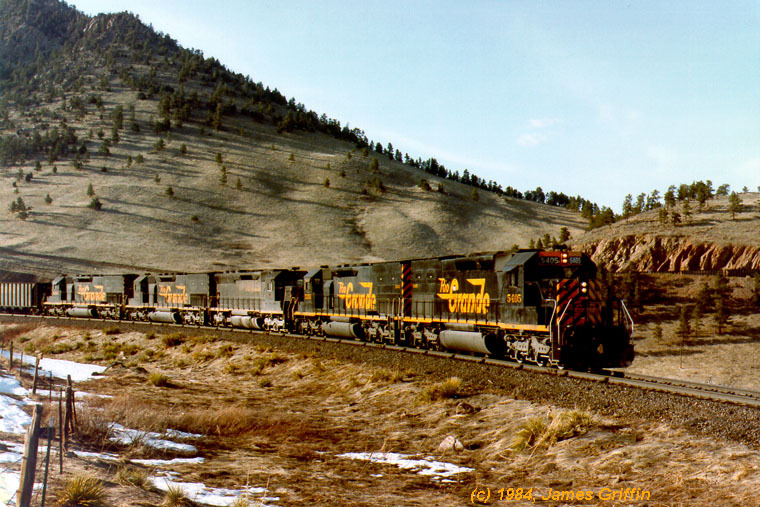 5347 — Nov. 1991, leading a unit coal train with 9 units, about to enter Tunnel 1. No, the hill’s not really this steep! This unit is featured in my Detailed Photos section.The 5347 was retired on 11/28/2001. Top: No. 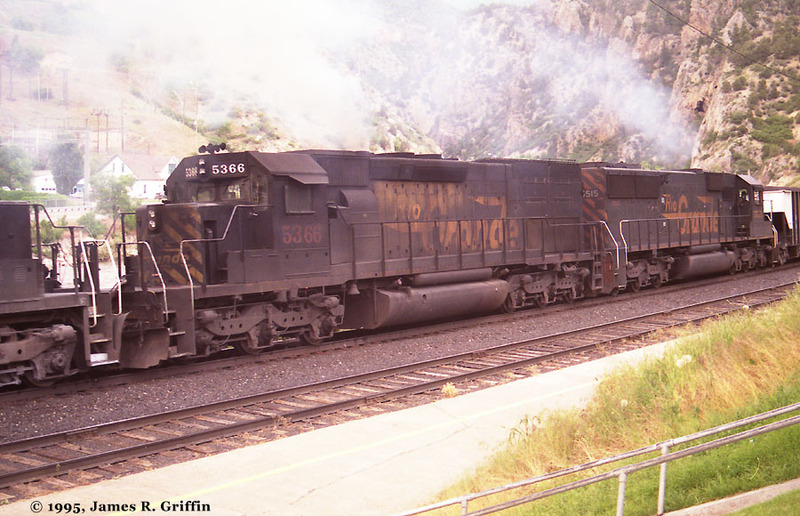 5348 — leading a hot freight at Coal Creek (July 1986). Bottom: No. 5348 at Denver’s North Yard (west side) on November 19, 1990. 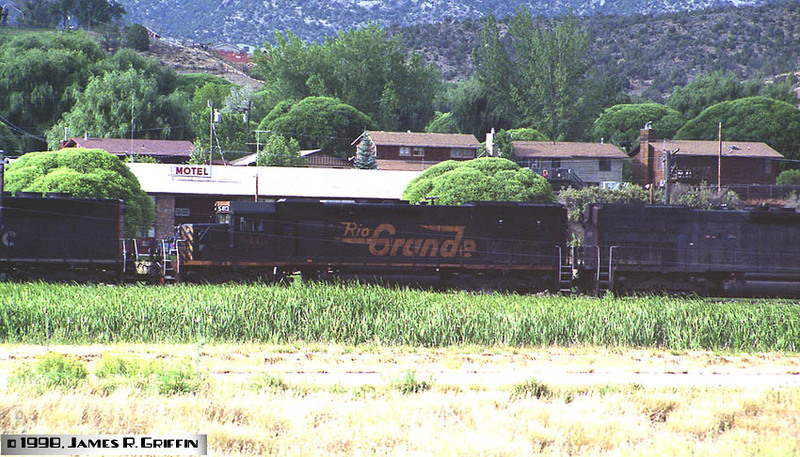 It’s in the middle of a road consist, preparing to hook onto a westbound train.The 5348 was wrecked on Nov 22, 1994 at Pando, along with fellow Tunnel Motor No. 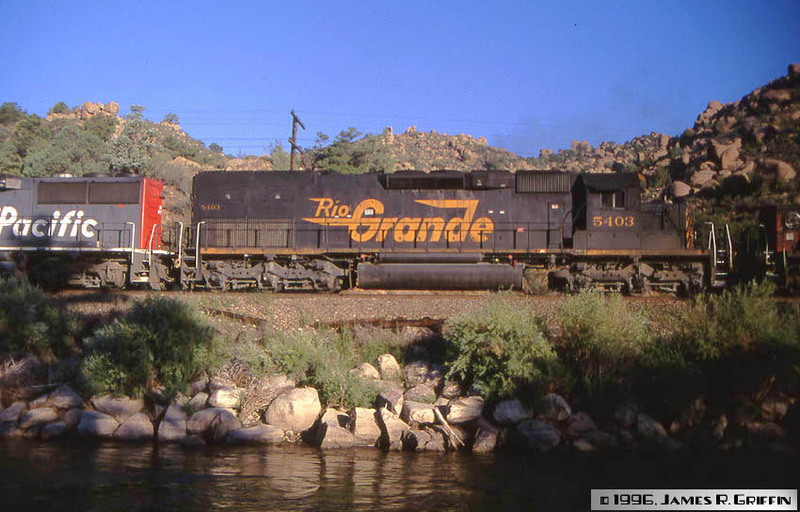 5370.
section.The 5350 was repainted into Southern Pacific colors prior to the UP merger. 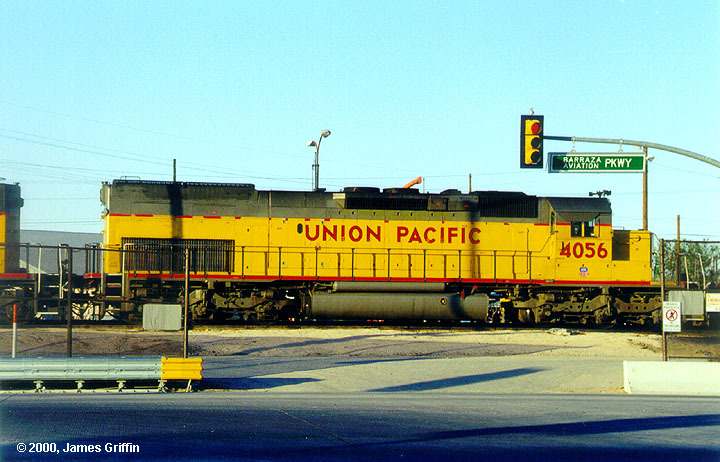 Since then it has been repainted again, as Union Pacific No. 8609. Three views of No. 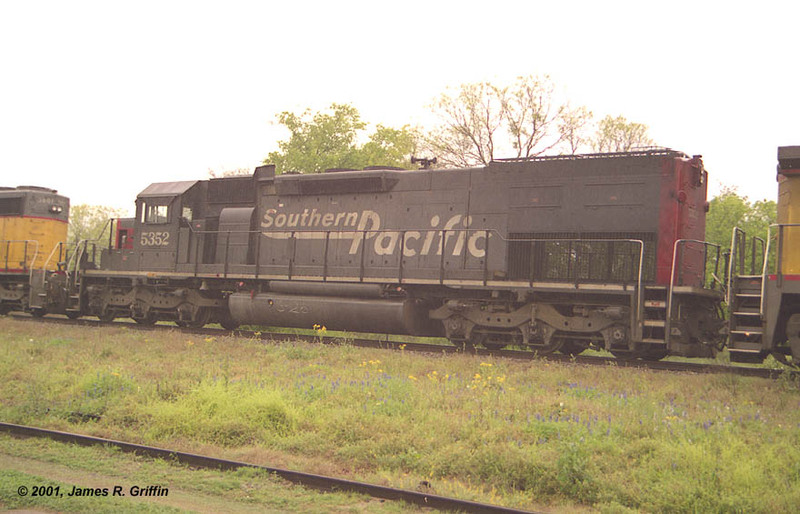 5352 — repainted into Southern Pacific colors prior to the UP merger, this unit was photographed at Campbellton, TX on the rainy afternoon of 3/23/2001. 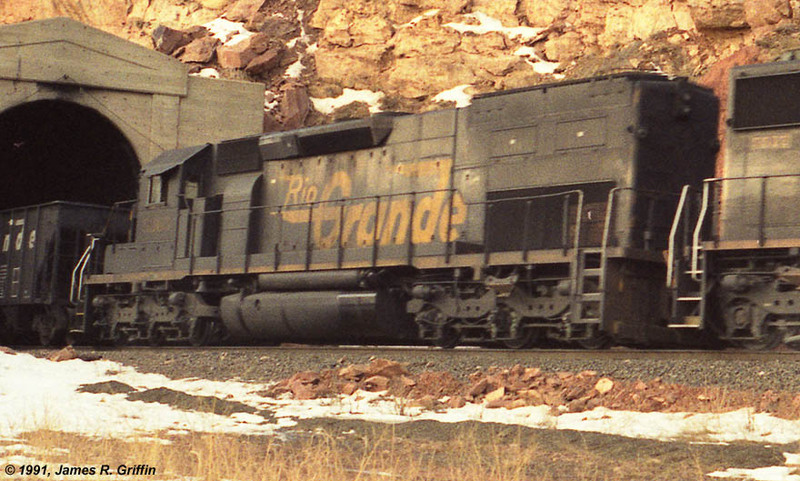 This unit, and other repaints of the SP era, originally had a small “D&RGW” caption under the cab numbers. By 2001 they are gone from the 5352. The 5352 was renumbered to UP 8610 10/8/2001, retired 12/26/2001, and went to a scrapper 4/15/2002. No. 5355. Brad Hoeme photo. 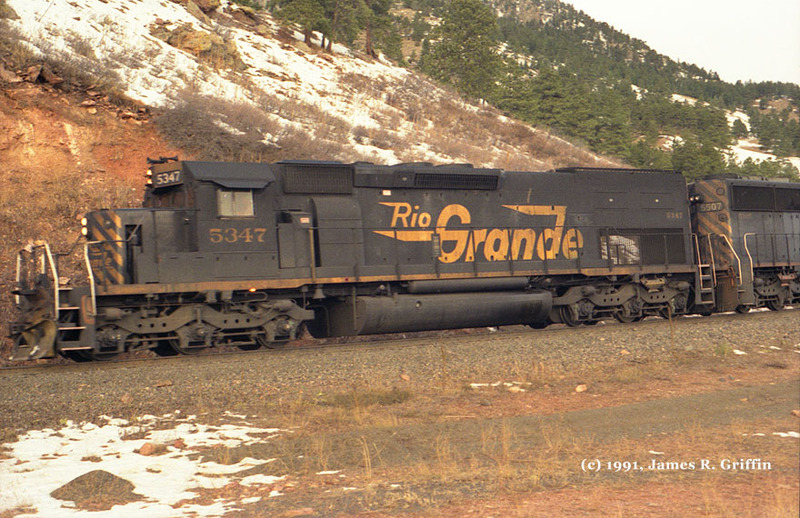 The 5355 was repainted into Union Pacific colors and numbered 4043, then renumbered 8613. TOP: No. 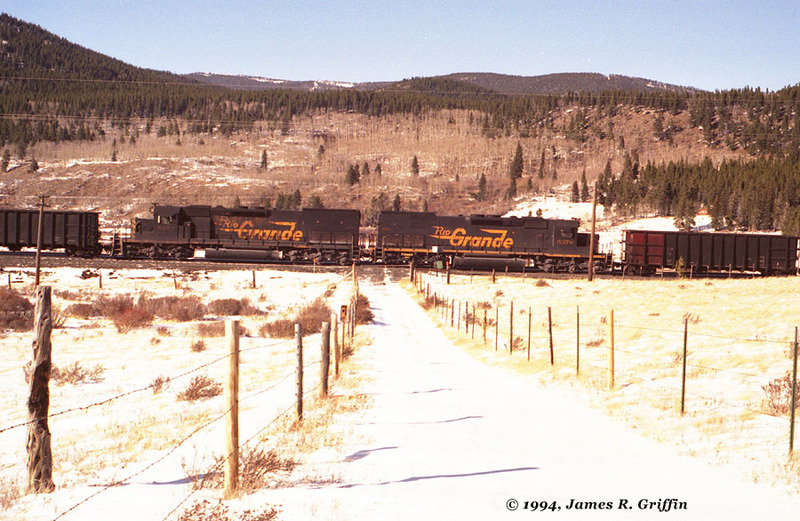 5356 leads two fellow Tunnel Motors and a GP30 (not visible) out of Coal Creek canyon, Thanksgiving Day 1982. The 5356 was patched to UP8614 on 1/10/03, then renumbered as UP7877 around 10/20/2003. No. 5357 leads five tunnel motors towards Price, east of Soldier Summit, in April 1998. Note the box on the nose where the lights used to be. 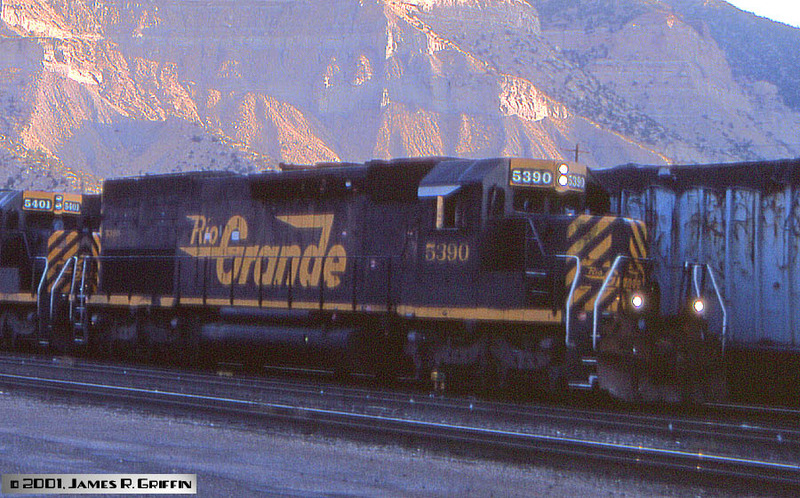 (Dennis Walts photo)The 5357 was renumbered to UP 8615 on 12/28/1999. 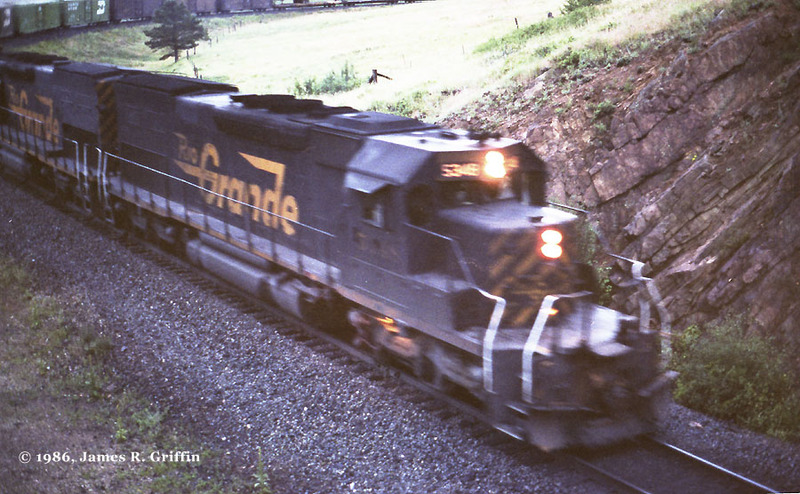 SD40T-2’s 5358 and 5362— Four Tunnel Motors and an SD45 are exiting Coal Creek with the CSDPU unit train, bound for Colorado Springs, in April of 1984. Both of these units now wear UP colors, as # 4046 and 4049, respectively. No. 5361, leading the MDVPU manifest freight through Sedalia on 4/26/2001. Three other tunnel motors (including one Espee unit) are trailing. No. 5361 was retired Nov 28, 2001 and subsequently sold (see the Deadline feature for later photos). Top: No. 5365 on Nov. 20, 1991 at Tunnel 1 (same train as the 5347 shot). There were 9 units on this coal train: 4-3-2. This one is part of the swing helper (mid-train set).Bottom: July 20, 1994 in the fog at the same location, but facing the other way. It was running as swing help, in tandem with EMD SD70M demonstrator # 7000, on the eastbound CSUX train. The 5365 was patched as UP 8622 on 5/07/2002. No. 5366 and SD50 No. 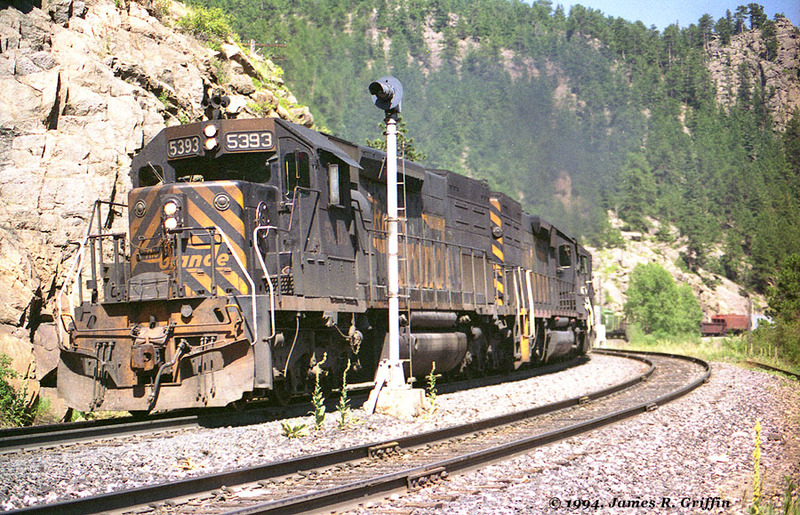 5515 are the lead two units of a four-unit swing helper pushing at Glenwood Springs, CO on June, 1995. 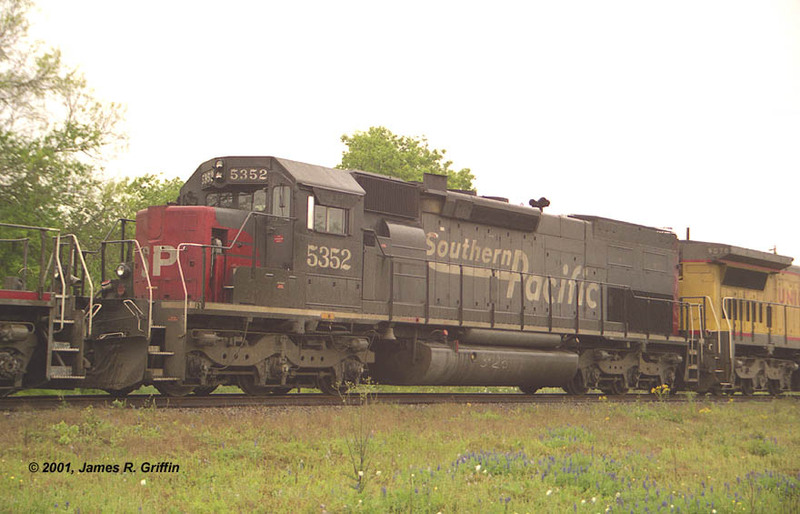 The other two units were a speed-lettered ex-SSW SD45T-2 and a SP SD40M. The 5366 was smoking up a storm on this day! 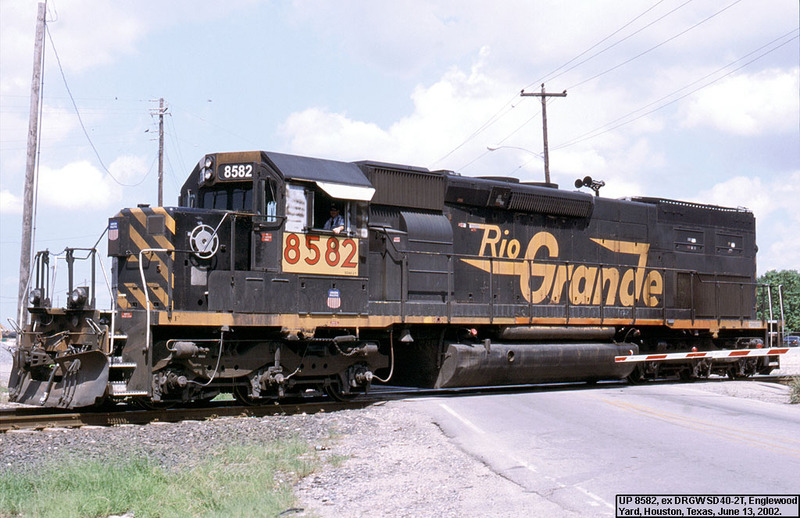 The 5366 was repainted into Union Pacific colors and renumbered 4053 on 12/12/97, renumbered again to 8623 in May 2000, and renumbered yet again to 2894 in January 2003. The former D&RGW No. 5369, now UP No. 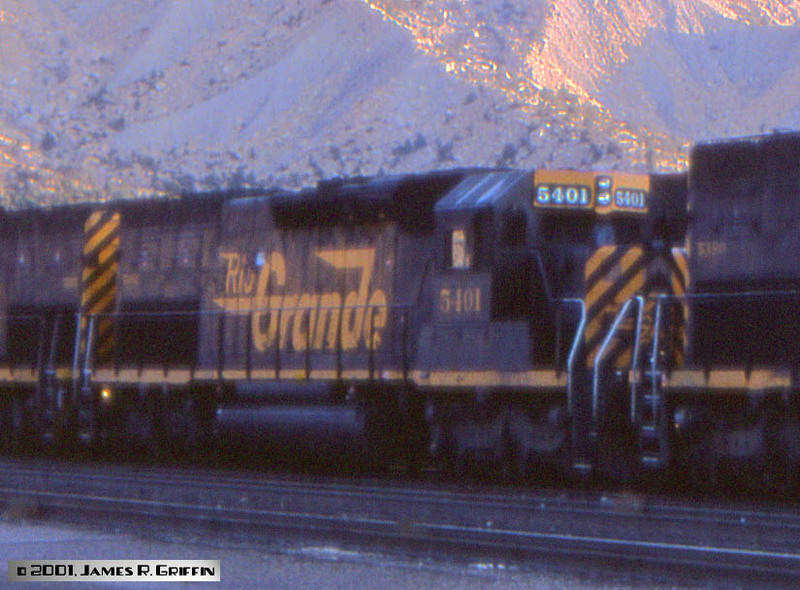 4056, sits third in an eastbound consist in the yard at Tucson, AZ on 3/31/2000. For a fairly recent repaint job, the upper stripe is in pretty poor shape! It looks like the Mars light is gone, but the horn is still over the cab. Shortly afterwards, it was renumbered to 8626. No. 5371 at Rocky, running second on the MRODV train on 11/25/2000. Horn is moved, class lights and Mars light gone, but looking good nonetheless. She also appears on my Helper page. 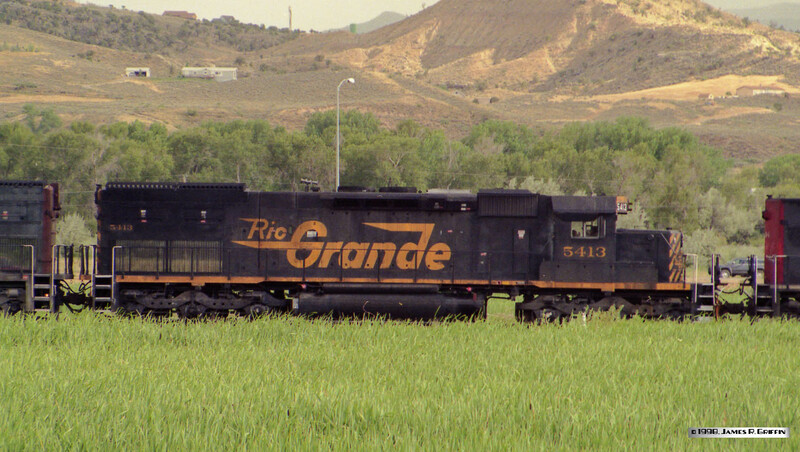 As things turned out, this would be the last active D&RGW unit not repainted or renumbered by Union Pacific. In a last-minute reprieve, UP decided to keep her in her original paint until retirement. 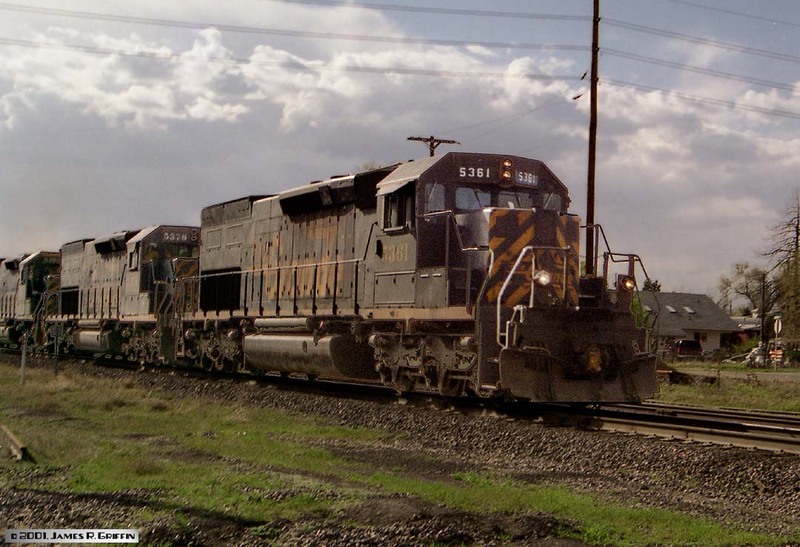 In 2008 she finally left for Cheyenne, where she was stored until being donated to the Ogden Rail Museum in 2009.BOTTOM: Here she’s seen in Helper, UT on November 10, 2001. (8/18/96). Here it shows the SPL modifications.The 5373 was patched to UP 8628 (6/27/01), and retired 8/29/01. scheme).UPDATE Starting 9/30/2009, it began working on the San Luis & Rio Grande, working out of Alamosa. This lasted only a year or so, however. 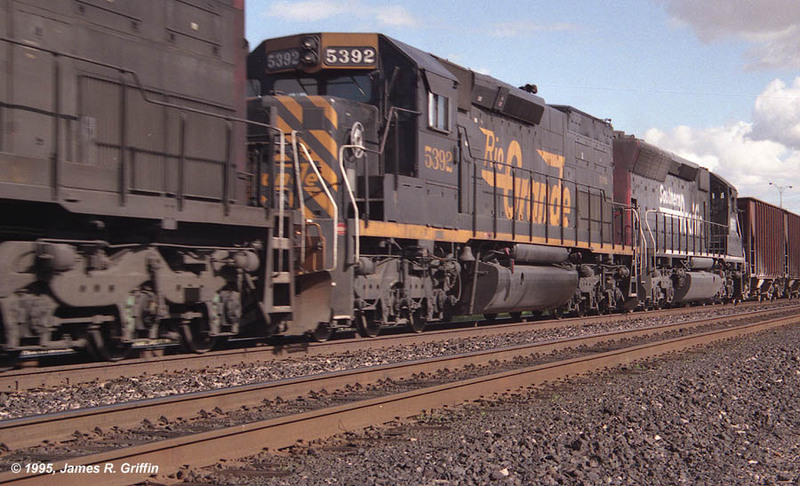 See my photo essay on the ex-5373. No. 5381— Viewed in North Yard, Denver in the summer of 1997. Steve Walden photo. 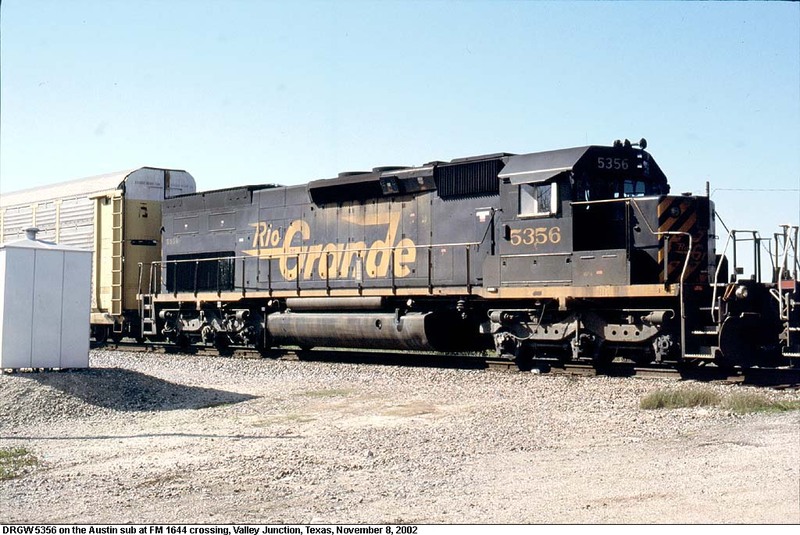 The 5381 was repainted into Union Pacific colors and renumbered 4065 (Brad Hoeme photo), then to 8635. No.5385 . 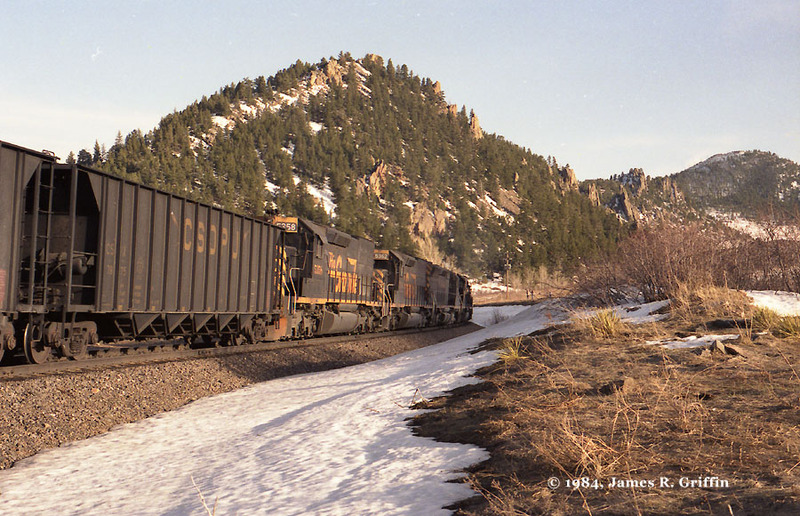 Top: leading the MRODV at Rocky on 11/25/2000. The Mars light gone, but the patch has been re-striped, and she’s looking good. Bottom: Southbound at Sedalia, April 26, 2001 on the MDVPU. The 5385 was patched as UP 8638 on 12/08/01. No. 5390, in Helper on November 10, 2001. The usual Espee modifications are evident. No. 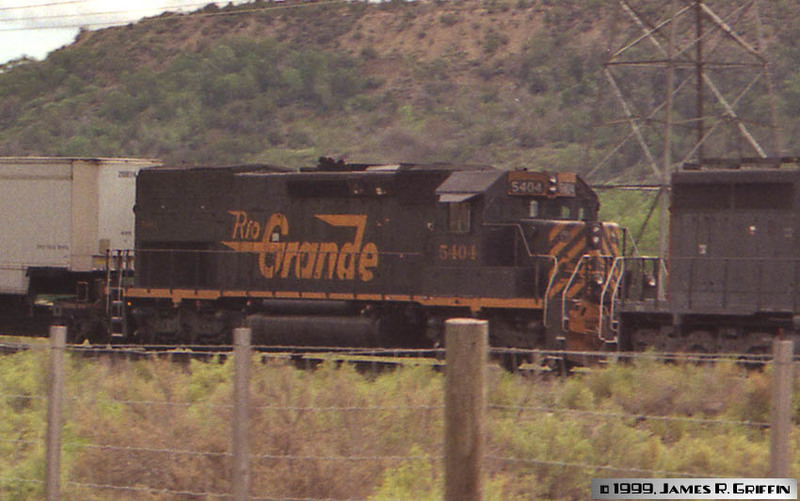 5390 was patched to UP 8583 on 10/25/2005, being the second-to-last active Rio Grande tunnel motor in original paint/number until that time. No. 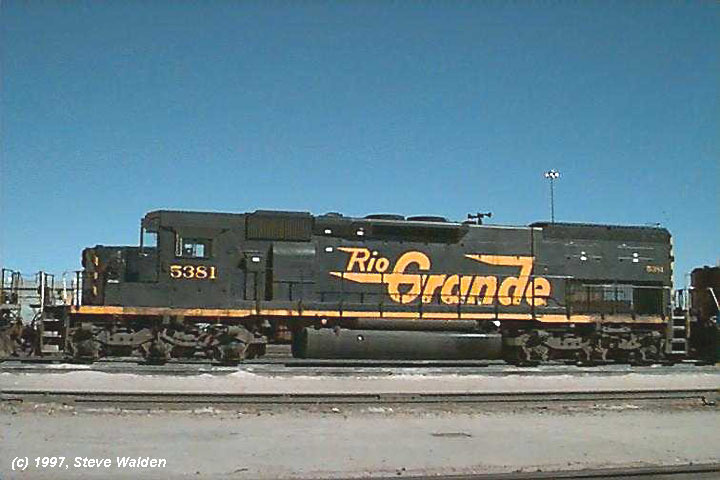 5392 is westbound at Tucson, AZ on March 12, 1995. It’s got ditch lights, relocated horns, and SP-style number boards. 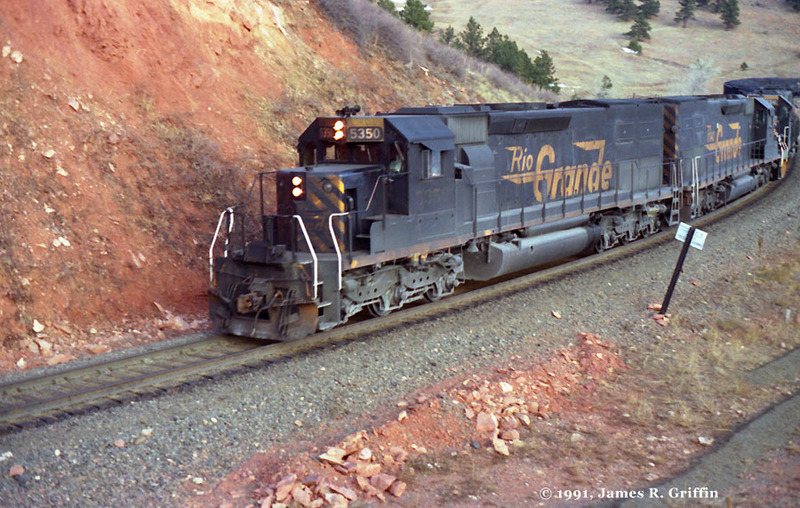 Also note the headlight box on the nose, now blanked.The 5392 was retired on 2/27/01. No. 5393 leads five SD’s on a long westbound drag at East Pinecliffe on 7/21/94. 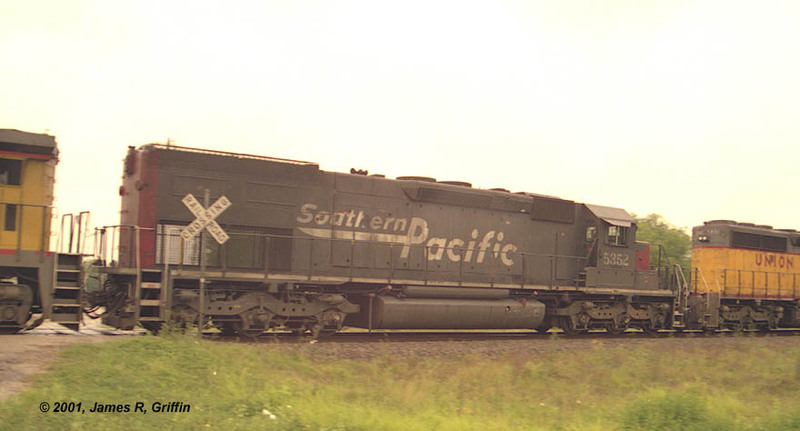 The 5393 was repainted into Southern Pacific colors prior to the UP merger, and renumbered to UP 8586 on 8/29/01. No. 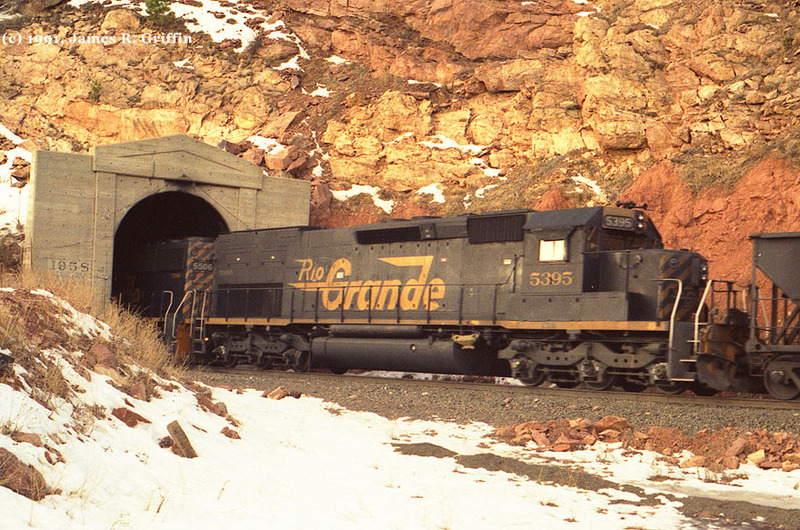 5395, seen Nov. 20, 1991 at Tunnel 1. You can see the external low-nose headlight box. 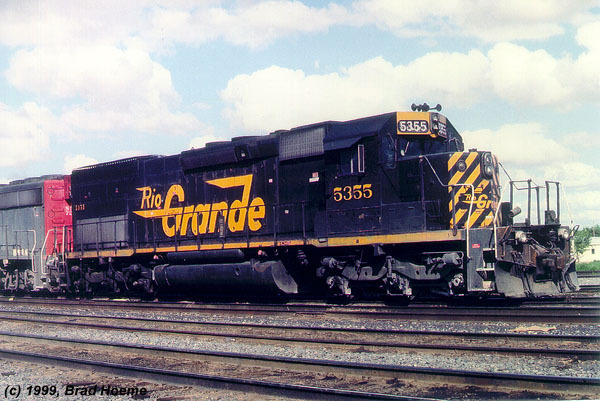 The 5395 was repainted into Union Pacific colors and renumbered 4018, then renumbered to 8588 on 3/26/1999. No. 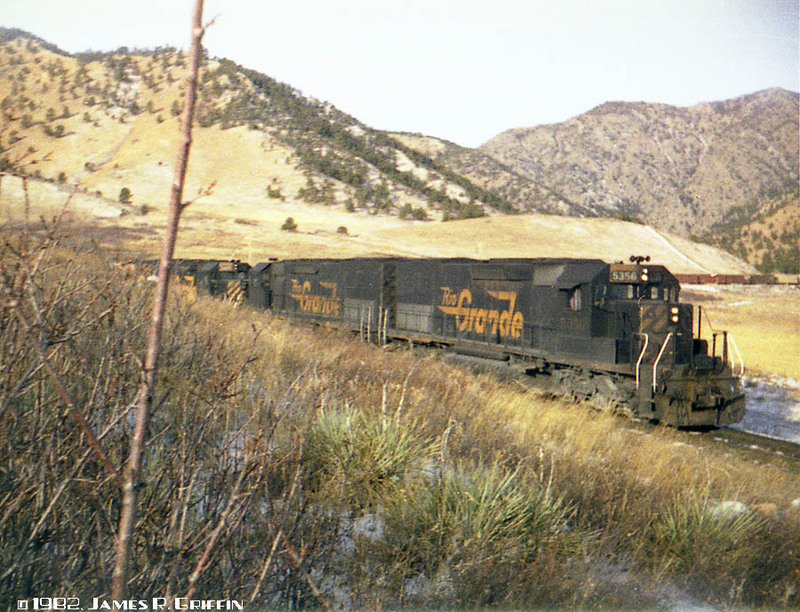 5401, on November 10, 2001 in Helper, Utah. No. 5401 was renumbered to UP 8594 6/30//2005. 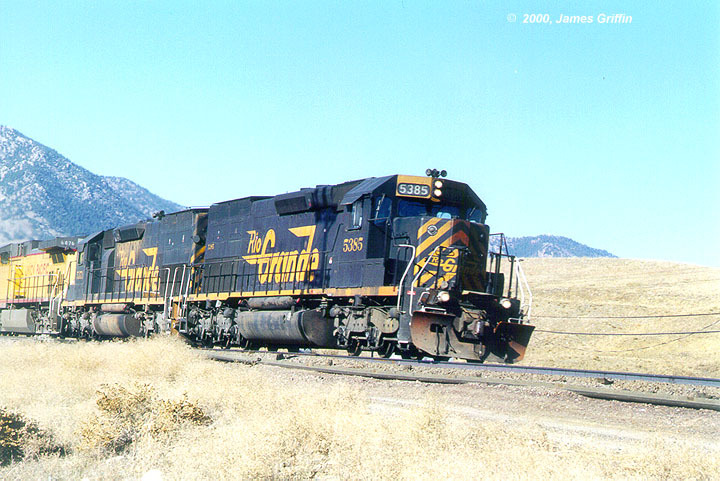 Aug 17, 1996The 5403 was repainted into Union Pacific colors and renumbered 8595 on 12/1/1999. sold by UP in December 2001, and reported seen in East St. Louis, missing parts (Jan 2006). 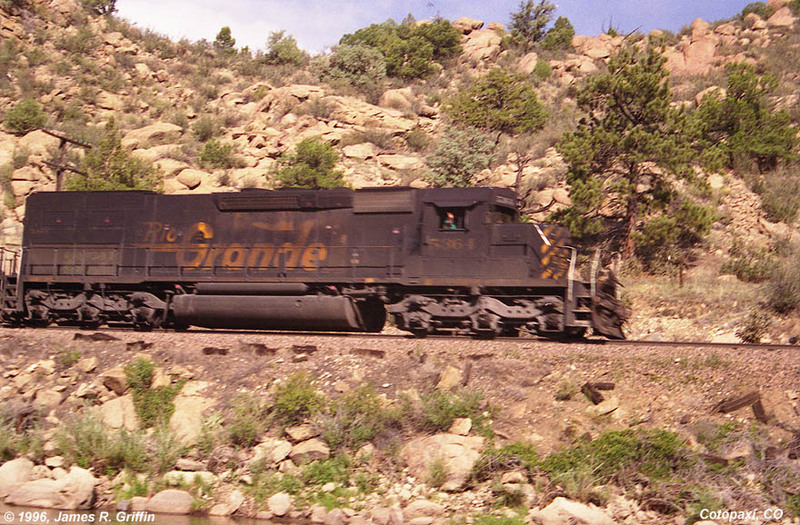 SD40T-2 Nos. 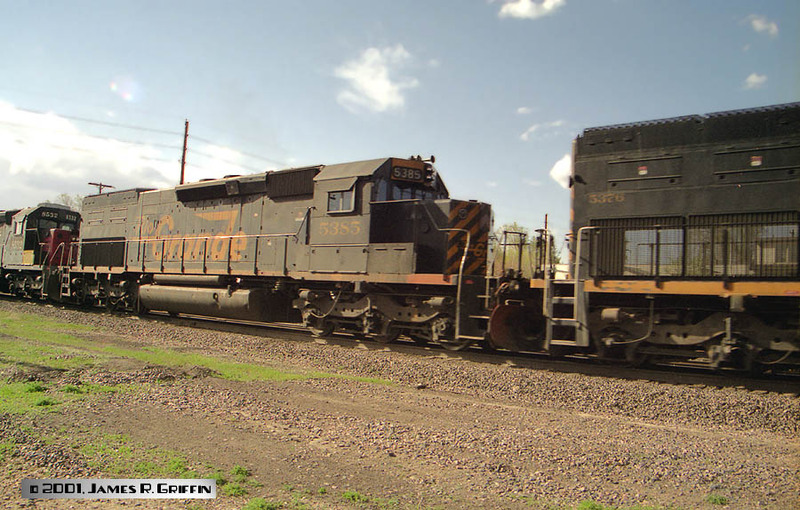 5405 and 5351, SD45 No. 5316, and tunnel motors 5362 and 5358, are leading the CSUX unit train at Coal Creek, April 8, 1984.The 5405 was retired on 2/27/2001. No. 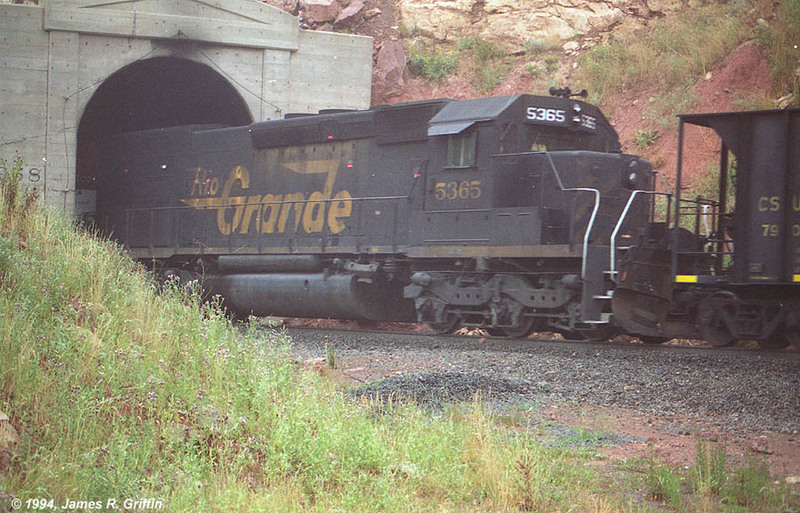 5413, the highest-numbered tunnel motor, in the siding at Silt with a dead manifest train on 8/3/98. Bottom: The opposite side is seen here, from across Interstate 70. The 5413 was retired on 12/19/01, and subsequently sold to the Wheeling & Lake Erie, where it currently retains its original paint.